Case of 5 UltiCare U-40 Pet Syringes 29g 1/2cc 1/2" 1/2 Unit Mark 100/bx has been specially made to offer your pet a smooth and pain-free injection experience. Ulticare pet syringes come in a variety of sizes and capacities - with each syringe crafted for a precise injection. 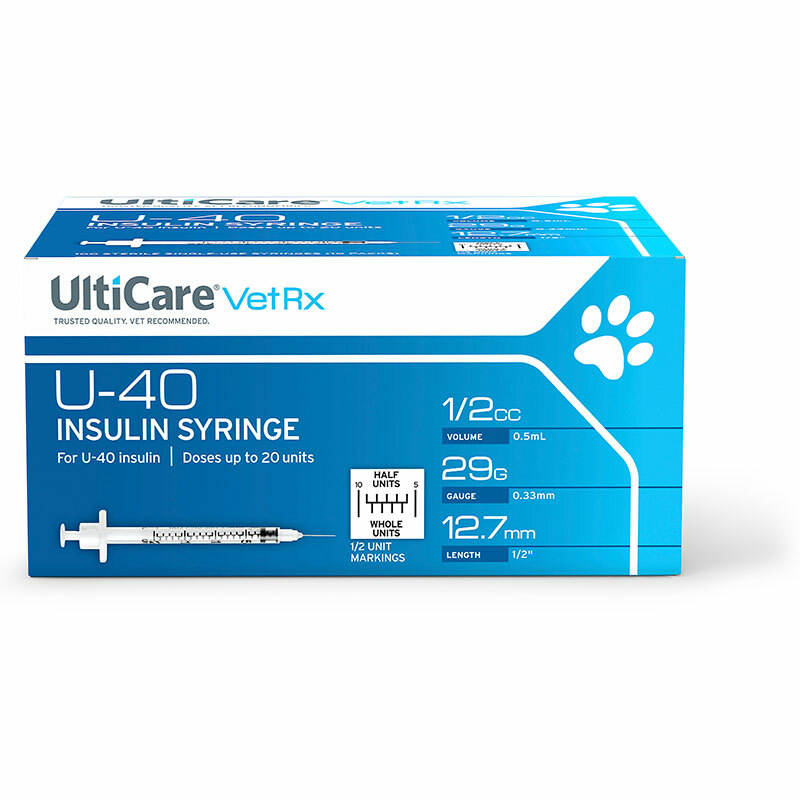 UltiCare U-40 Pet Syringes 29G 1/2cc 1/2" - Half Unit Markings - Case of 5 makes it easier to draw an accurate dose for pets being treated with low or half unit doses of U-40 insulin. When choosing an insulin syringe, always be certain that the concentration of the insulin you are using works with the syringes you are using. The vial of insulin and packages of the syringes will be clearly marked as U-40 or U-100. You never want to mix these. Always use U-40 insulin with U-40 syringes. Clear, bold, easy-to-read markings help accurately draw up both full and half-unit doses. Triple beveled tip for easier insertion. Electromagnetically polished for a smoother finish. These syringes are only to be used with U-40 insulin. Do not sterilize or reuse syringe.